Want to make your Christmas decorations unique with a light projector? Here are the top 10 best rated Christmas light projectors in 2018. 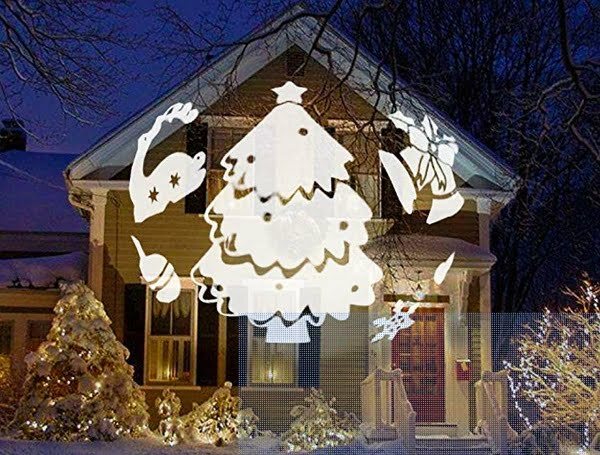 A Christmas light projector is a neat gadget that takes the Holiday lighting to the next level. You can choose different styles and patterns, as well as types of projectors. From moving lights to 3D images, from LED to laser lights. The choices are endless. So how do you choose the best? We aim to help you. We’ve examined a lot of light projectors to find only the best options available. Check them out and choose one (or more) based on your personal needs. 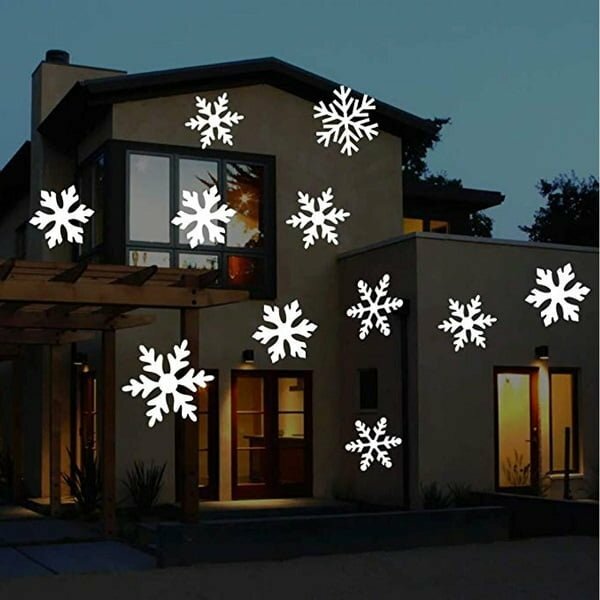 This LED Christmas light projector creates a beautiful snowflake and snowfall effect perfect for any exterior. 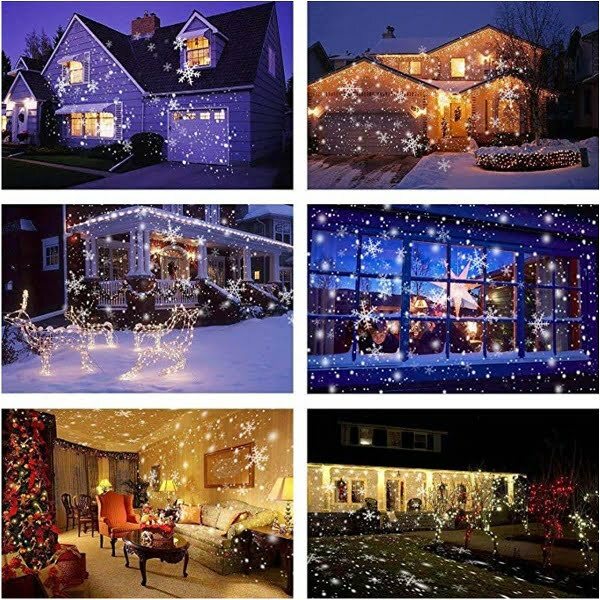 High brightness LEDs create falling snow on the surface of your house for an instant winter wonderland. The projector is waterproof and comes with an RF remote system for easy control. Why it’s our pick? It’s a high-quality Christmas light projector with a snowflake and snowfall pattern. It’s easy to operate with a remote control, and it can be used outside or inside. 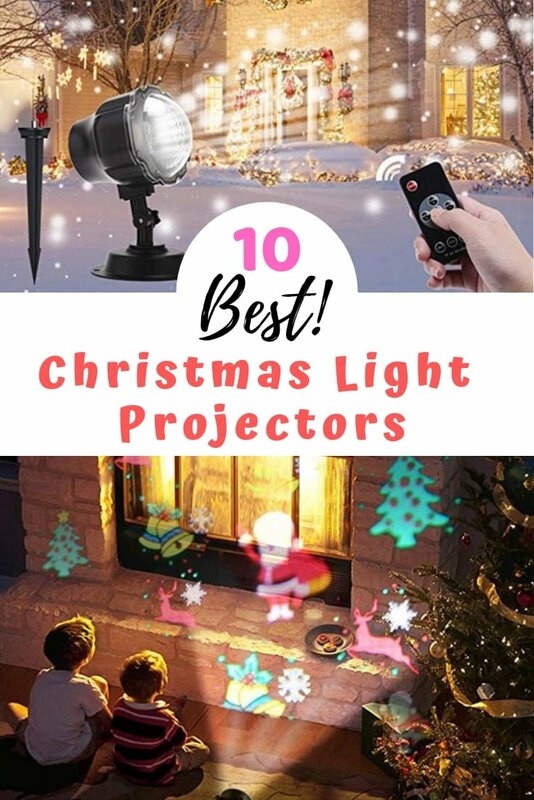 This projector is excellent to create a magical Christmas lighting scene. 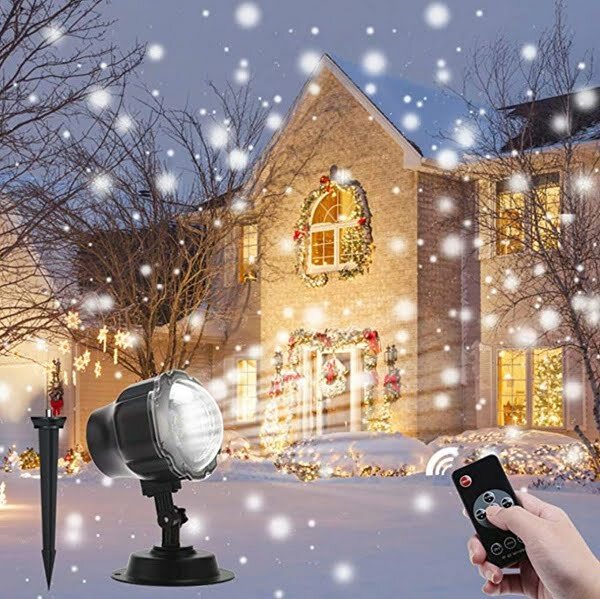 This romantic Christmas lights projector features moving snow flurries and is waterproof, perfect for any weather. It comes with an 8M cable for easy installation. Soft, warm Christmas lighting can be adjusted according to 4-speed modes. Why it’s one of our top picks? This Christmas light projector is a product of the same company as the previous one on our list, it shares the same high quality. It gives you a different lighting pattern so it’s something to choose for your liking. The projector is also easy to operate and it can be used indoors and outdoors. 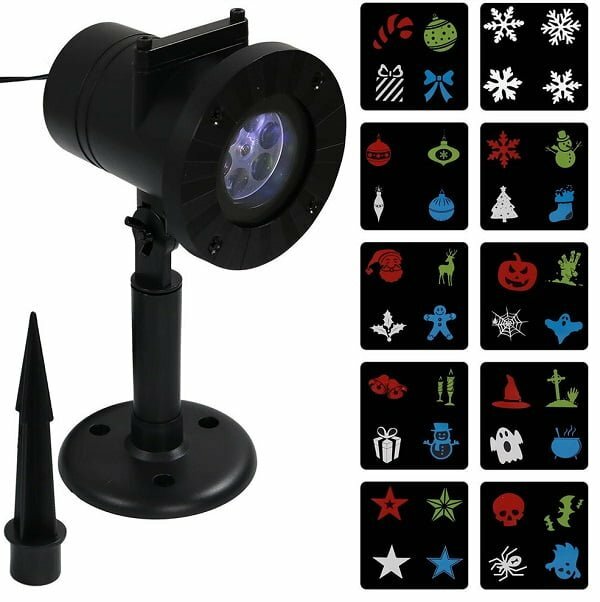 This Christmas lights projector comes with different light designs, 360-degree rotation, and 3D visual effects. Choose from 20 patterns in bright HD lights which you can adjust, whether you want soft, shiny, bright, or stationary Christmas lighting effects. Why it’s our choice? 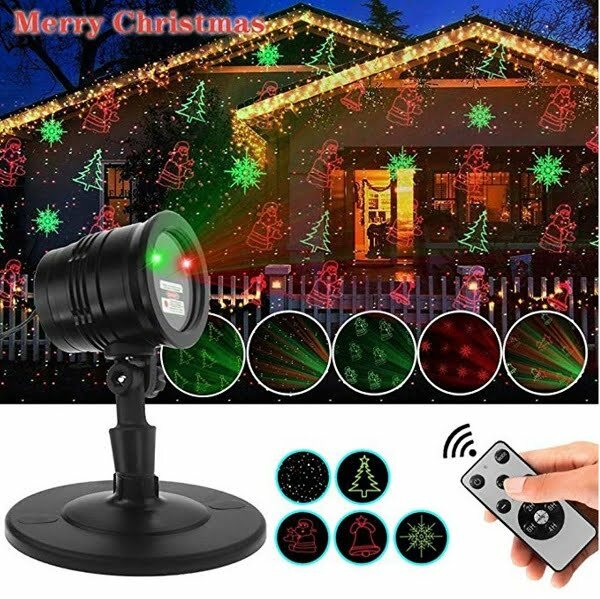 This Christmas light projector creates a cool 3D image effect that will make your Christmas lights unique. It’s a high-quality but affordable product for those who are looking to create an effect in their Holiday decor. Gentle, soft LED lights project colorful images from interchangeable slides for a holiday lighting presentation that everyone can enjoy. This Christmas LED projector features 20 pieces of seasonal slides to fit any season, from Christmas to St. Patrick’s Day. The kit comes with a round base and an extended ground stake for easy installation. Why do we like this product? This is a universal light projector for several popular Holidays throughout the year. It includes 20 patterns to choose from. The projector is a high-quality affordable option. CrazyLynX Projector Lights features 16 different slides to fit separate occasions and a remote for easy control from 65 feet away. Choose among different mode settings including dynamic, fixed, twinkle and off. Why it’s our pick? This is another option for a Holiday light projector. It includes 16 slides with different light patterns that you can use for different occasions many times. UNIFUN 15 Patterns LED projector features an auto-rotating, dynamic light presentation to showcase 15 different colorful slides, from Santa to clowns. The projector is ideal for both interior and exterior environments. High quality LED will ensure that you get vibrant colors and sharp images. Why it’s our choice? It’s another great Christmas light projector with several multi-color pattern options (that include other Holidays too). 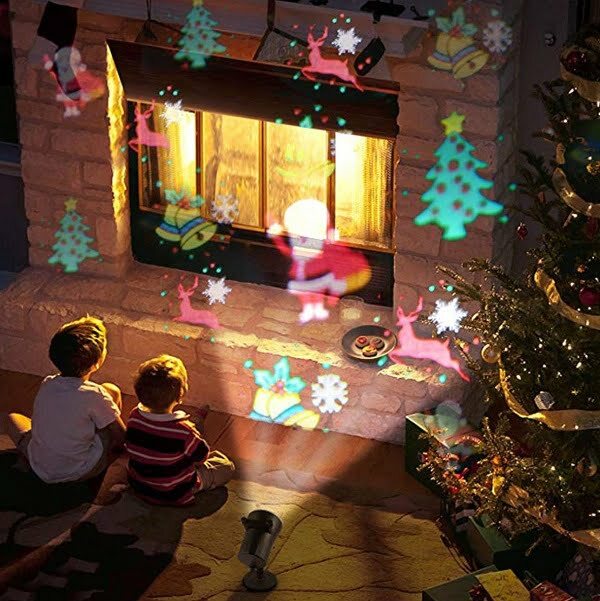 This Christmas projector features a red and green laser display that changes shapes and produces sparkling effects for a festive holiday atmosphere. The blue and green lights vary in configuration to create different effects, from colorful light blocks to scattered dots of Christmas light. The lights cover up to 600 square feet of surface. It is water resistant and comes with an RF wireless remote control function. Why it’s one of our top picks? It’s a great option if you’re looking for great laser lights for your Christmas decor. This multicolor 6-watt LED projector allows you to shine different images onto the wall from Christmas staples like stars and snowflakes to Halloween monsters. Choose from 10 pattern slide cards for festive images that cover up to 600 square feet of surface. The system is easy to set up and use. Install the mounting plate or stake and insert the card pattern to use. The system is built with a card protector to protect your cards from the elements if it is installed outside. Why it’s one of our choices? 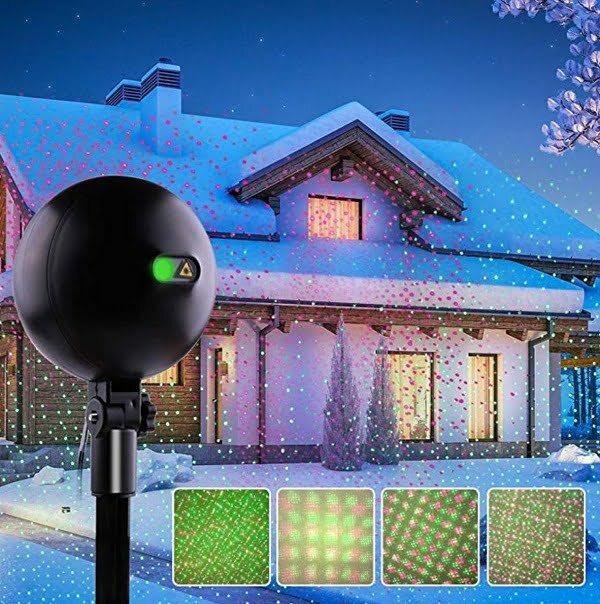 This multi-color Holiday light projector is another high-quality popular gadget to decorate your outdoors or indoors for the occasion. This Instecho Christmas LED projector features 12 pattern slides that include trees, snowflakes, and bells. 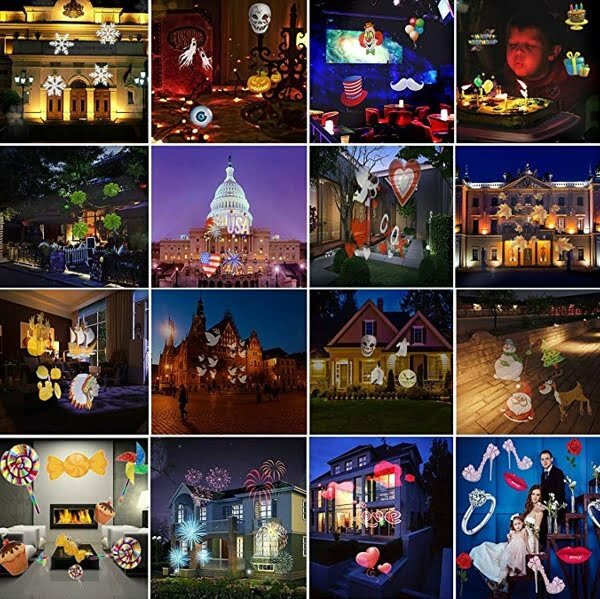 Bright LEDs assure sharp and colorful images for Christmas and even regular parties. It is also waterproof and comes with an RF remote control accessible from 50 feet away, even from inside the house. This makes it easy to control your exterior lighting even when it’s snowing outside. Why it’s our pick? 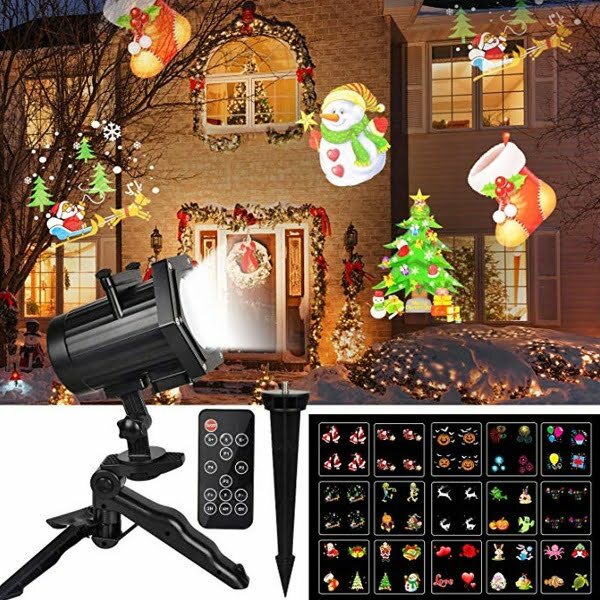 This moving landscape Christmas light projector is another great option to choose from. It’s also one of the highest rated projectors on Amazon. This Laser Lights projector comes with five lighting patterns for the perfect Christmas decor. Choose among Santa Claus, Christmas trees, Jingle Bells, Snows and Stars. Choose to keep lights stationary or twinkling and flashing. You can also adjust the speeds. The system is waterproof and can be remotely controlled within 33 feet. Why it’s our pick? You get 5 patterns of Christmas laser lights with this high-quality product.